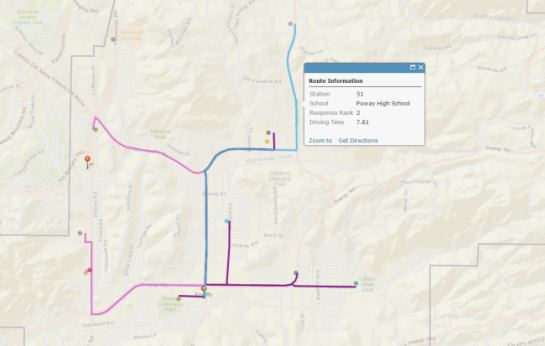 This example use case presents an approach to using ArcGIS to find out which is the closest fire station to each school in terms of travel time. The information will allow the fire department to develop emergency response plans. While the data is real, the scenario, analysis, and resulting decisions are hypothetical. The purpose of the example is to illustrate the type of problem that can be addressed by finding the nearest facility to each location. Which fire station is the closest to each school? With violent incidents at schools seemingly on the rise across the country, pressure has increased from parents in the community to make sure the city's first responders are prepared for an emergency. In light of this, the fire department, sheriff's department, local hospital, and other agencies are reviewing the city's emergency response plans. As part of the review, the Director of Safety Services wants to find out—for each school—which fire station is closest in terms of drive time. The nearest station will be assigned as the primary responding station for each school. In addition, the director will have the firefighters at each station visit the schools on their list to become familiar with the access to and layout of each. They will also meet with the administration and staff at each school to discuss emergency response plans for the school. The director assigns the task of creating the maps to the division chief for emergency preparedness. 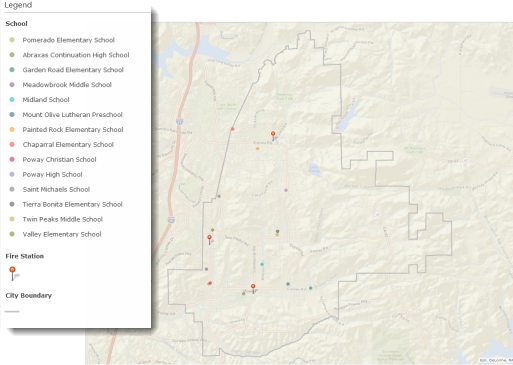 Using ArcGIS, the chief will use the find nearest capability, which finds the nearest facility for each location—in this case, the closest station for each school. The lines—color-coded by fire station—show which station is the closest to each school. The chief sends the draft set of maps out to the fire stations for review. Being very familiar with the city's streets and traffic flow, the firefighters at Station 53 are convinced that one of the other two stations would likely reach the several schools on the east side of the city before they could, as the trucks from Station 53 would have to travel through the downtown area to reach the schools. They believe this would especially be the case during the school day when there is traffic on the roads. The division chief will run the analysis again, this time using traffic conditions for midmorning and for midafternoon. Meanwhile, the director—having seen the initial maps—has decided that it would be beneficial to also find out the second closest station to each school. That station will provide backup or respond if the primary station is on another call. 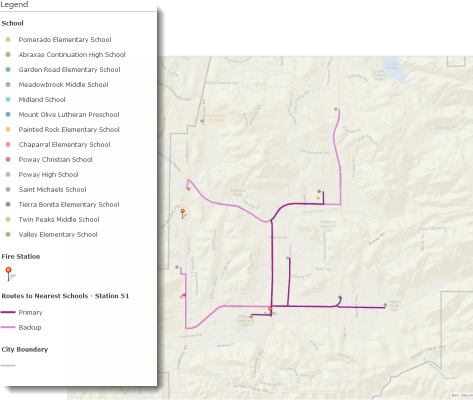 The new analyses using morning and afternoon traffic conditions show the same pattern at both times—Station 51 is, in fact, the closest station to the two eastside schools when daytime traffic is considered. When daytime traffic is considered, the two schools on the east side are actually closer to Station 51 than to Station 53. In the new analysis, the assignments also happen to be more equal—five schools for Station 53 and six for Station 51 (as opposed to seven and four, respectively, in the earlier analysis). The director decides to accept the analysis using daytime traffic and assign the two eastside schools to Station 51. With the decision by the director, the division chief creates maps showing the backup assignments for each station. The route lines on the three maps show which schools have Station 51, Station 52, and Station 53 (from left to right) as their backup (second closest) station. The director presents the maps to the emergency response review committee, which decides to include all the maps in the city's emergency response guide. Copies are made available for firefighters to download to their mobile devices, and printed posters are also sent to the stations to be displayed on the wall. Word soon trickles back to the division chief that, while the maps are useful, what the firefighters would really like to see are the primary and backup assignments on a single map for each station. The chief has saved the results of the analysis, so it's easy to create the new maps. The map for Station 51 shows routes to schools that are assigned to the station as primary response (dark lines) and backup response (light lines). The firefighters download the new maps to their mobile devices. They quickly discover that by selecting a route they can get the estimated drive time to that school. 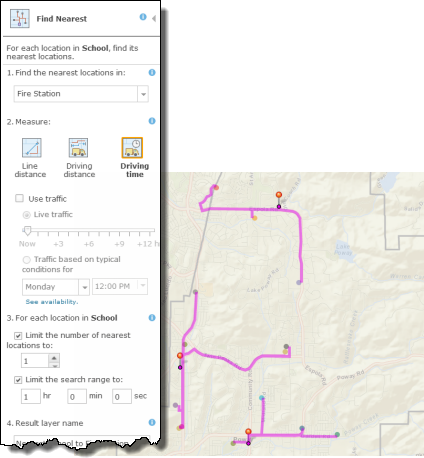 By selecting a route on the map, firefighters can get the name of the school, confirm whether it's a primary (Rank 1) or backup (Rank 2) response, and see the drive time to the school (in minutes) via that route. When he visits the stations, the division chief hears that the firefighters are finding the maps useful for quickly seeing the schools assigned to their station. In a few cases, they question the maps, believing there may be faster routes to the schools. The chief asks each station to review the maps and indicate which routes they think may be inaccurate. He will use the information to see if he can improve the analysis by using different parameters. The firefighters also tell the chief they'd like to be able to select a school and get information on the grades, number of students and staff, number of buildings, and so on. The chief tells them he will contact the school district to see about adding this information to the maps. Use the Find Nearest tool to find the closest station to each school. The resulting ConnectingLinesLayer shows the route from each school to the nearest fire station. The information for each route includes the name of the school, the number of the fire station, the drive time, and other information. 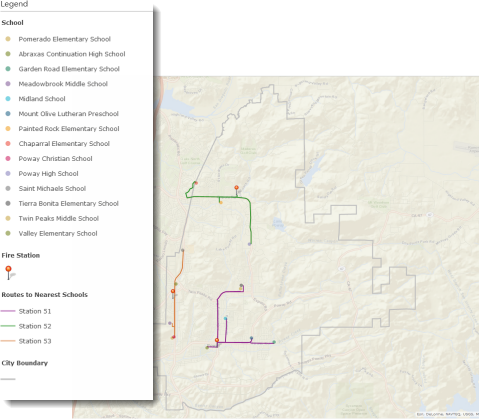 Create a map showing the routes to the schools, color-coded by fire station, by symbolizing the ConnectingLinesLayer using the station number field. You can also change the labels to the Station text. Use the Find Nearest tool, and limit the number of nearest locations to two. Specify typical traffic conditions for a day and time during school hours, such as Wednesday at 10:00 a.m. Routes are created between each school and its closest and next closest fire stations. The FacilityRank field in the ConnectingLinesLayer indicates whether the route is for the closest station (a value of 1) or second closest (a value of 2). To create a map showing the primary assignments for a station, filter the ConnectingLinesLayer to select FacilityRank equal to 1, and the station number equal to the fire station you're creating the map for. You can then change the symbol for the layer if you want. To create a map showing the backup assignments for a station, edit the filter to select FacilityRank equal to 2. To create a map showing both the primary and backup assignments for a fire station, use Filter on the ConnectingLinesLayer and set the station number equal to the fire station you're creating the map for (with no filtering based on FacilityRank). Then symbolize the layer on the FacilityRank field. You can also change the label to something more meaningful, like Primary and Backup. 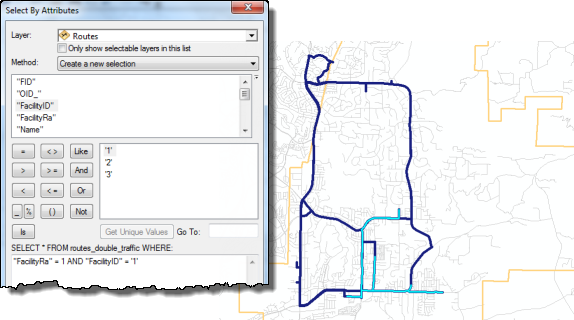 To create the routes in ArcGIS Desktop, you use the Network Analyst closest facility solver. 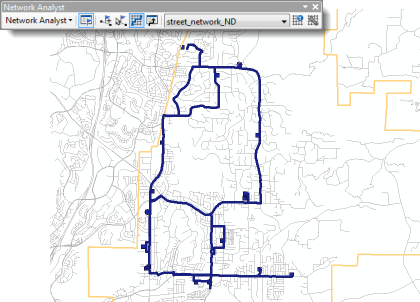 You'll need ArcGIS Network Analyst extension installed and a street network dataset that contains traffic information. If you don't have the extension or the network dataset, an alternative is to use the FindClosestFacilitiesready-to-use service—the street and traffic data is provided for you. 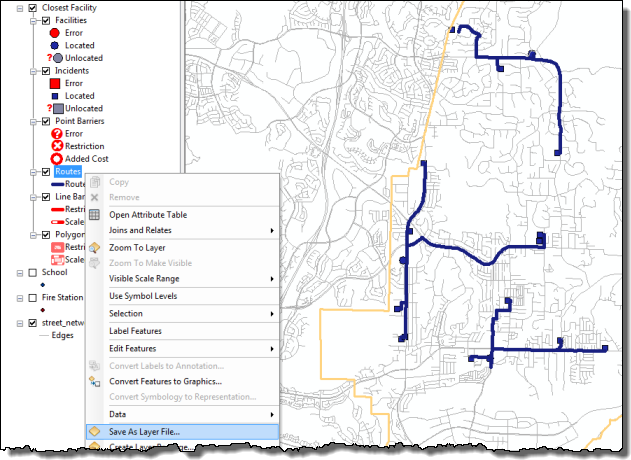 The routes are calculated using ArcGIS Online (you will need an ArcGIS Online account) and added to ArcMap so you can complete your analysis and create the final maps using the more powerful mapping capabilities in ArcGIS Desktop. Both approaches are described below. Once you've created the routes you can create the appropriate maps. Before setting up and running the analysis, you need to create a new Network Analyst layer in ArcMap and load the fire stations and schools as facilities and incidents, respectively. On the Network Analyst toolbar, use the drop-down menu to select New Closest Facility. The Closest Facility layer is added to the table of contents. Then click the button with the blue flag on the toolbar (next to the drop-down menu) to display the Network Analyst window. 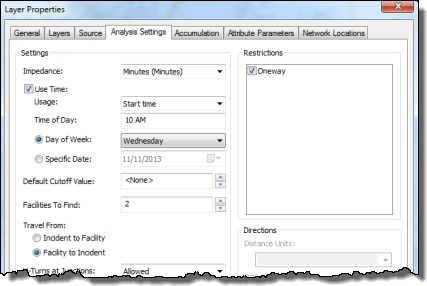 In the Network Analyst window, right-click Facilities and select Load Locations to load the fire stations. Under the facilities Name, specify the station number (STA_NUM) field. Right-click Incidents and load the schools. The school name is automatically used for the incidents Name field. Now set up the analysis parameters. In the table of contents, right-click Closest Facility and select Properties. On the Analysis Settings tab, set the properties as shown below to calculate the closest fire station to each school (without using traffic conditions). 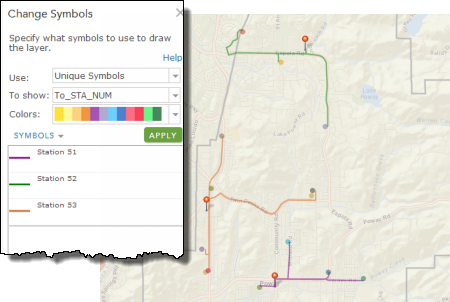 Click the Solve button on the Network Analyst toolbar to calculate and display the routes. Finally, save the routes as a layer file. To find the closest and next closest fire station to each school using daytime traffic conditions, open the Closest Facility layer properties dialog box again. On the Analysis Settings tab, set the Time of Day and Day of Week settings to a day and time during school hours, such as 10:00 a.m. on Wednesday. Set the Facilities To Find parameter to 2. 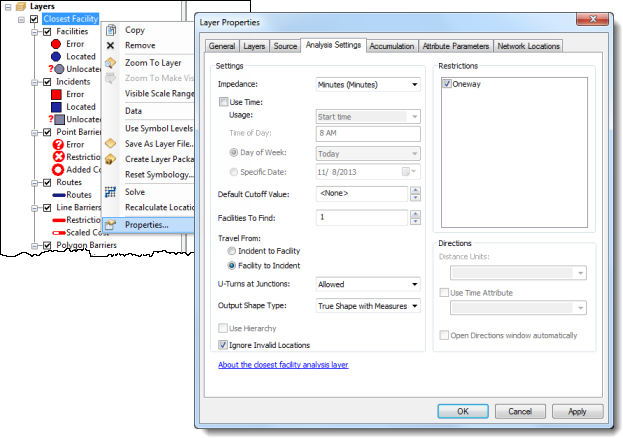 Click the Solve button on the Network Analyst toolbar and save the resulting routes as a layer file, as shown above. 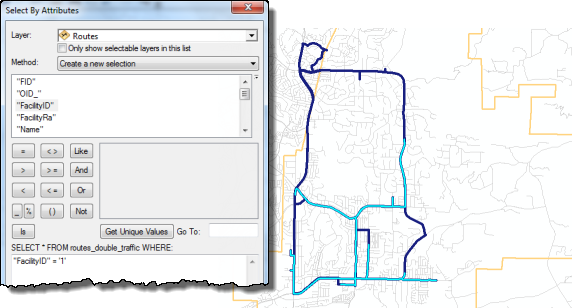 From ArcMap, log in to your ArcGIS Online account. 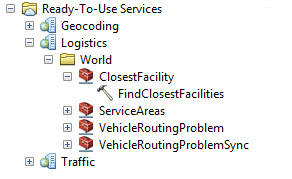 Then, in the Catalog window, open the FindClosestFacilities service. FindClosestFacilities uses the same underlying technology as the Find Nearest tool in ArcGIS Online, but it gives you many more parameters for refining your analysis. For example, you can specify that you are routing an emergency vehicle, that the routes should avoid gates and roads under construction, and many other options. Before starting, you may want to add the Streets basemap layer to your map, for context. For the initial analysis, set the parameters as shown below. 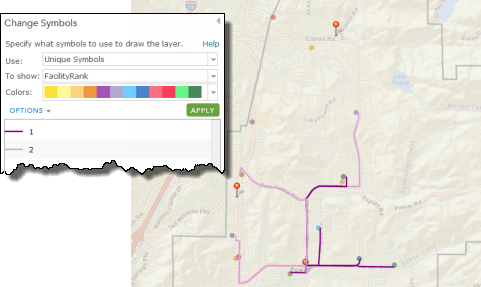 When you run the tool, the output routes are added as a new layer to the map. To find the closest and next closest fire station to each school using daytime traffic conditions, open the FindClosestFacilities tool again. Set the Time of Day and Day of Week to a day and time during school hours, such as 10:00 a.m. on Wednesday, and set the Number of Facilities to Find parameter to 2. 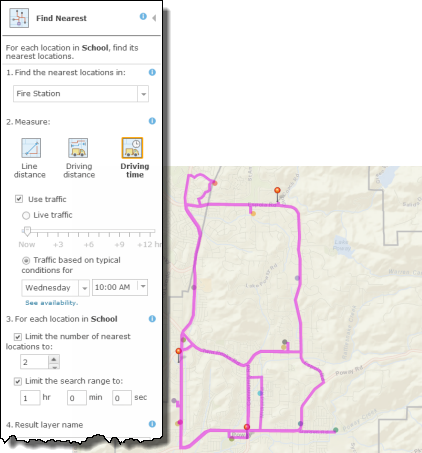 Symbolize the routes layer using the FacilityID field to show which station is the closest one to each school. You can also label the stations and schools with their names. 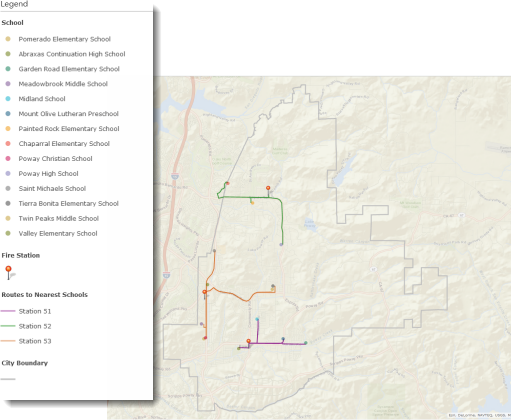 To create a map showing the primary assignments for a station, use Select By Attributes with the routes layer that includes the closest and second closest station to each school. Set FacilityRa equal to 1, and set the FacilityID equal to the fire station you're creating the map for. Create a layer from the selected features and change the symbol for the layer if you want. To create a map showing the backup assignments for a station, open the Select By Attributes dialog box again, and edit the selection statement to select FacilityRa equal to 2. 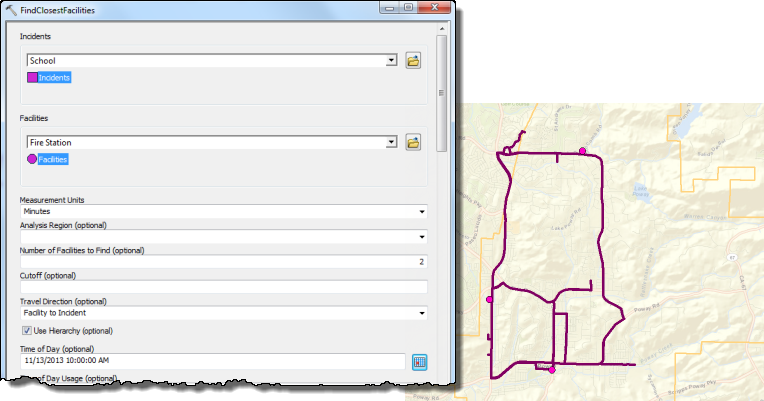 Once again, create a layer from the selected features, and then change the symbol for the routes. Add the schools and fire stations to the map and label them. To create a map showing both the primary and backup assignments for a fire station, clear the selection (if necessary), open the Select By Attributes dialog box, and select the FacilityID equal to the fire station you're creating the map for. Create a layer from the selected features. Then symbolize the layer on the FacilityRa field. You can also change the labels to something more meaningful, like Primary and Backup.